An iconic landmark on Cazenovia’s Albany Street, the Lincklaen House is a hallmark of the village’s history. The need for a hotel was voiced in 1835 by prominent members of the village to accommodate the expanding village. Soon funds were raised via public stock subscriptions and the contributors bestowed the town founder’s surname on the project calling it the Lincklaen House. The hotel was built from locally sourced quarries and bricks and by November 1836 it was ready for visitors. The rise of industry along Chittenango Creek resulted in an influx of business and means of transportation such as the Plank Road, the turnpike and railroads. 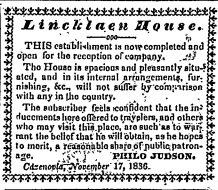 It was not uncommon for as many as 20 stagecoaches a day to stop in front of the Lincklaen House carrying visitors to Cazenovia. Through fires, renovations and numerous owners, the hotel still stands and caters to visitors and Cazenovians alike, providing overnight lodging and dining opportunities. The Cazenovia Preservation Foundation holds a facade easement on the Lincklaen house to ensure that it will always maintain the look seen in this historic image.